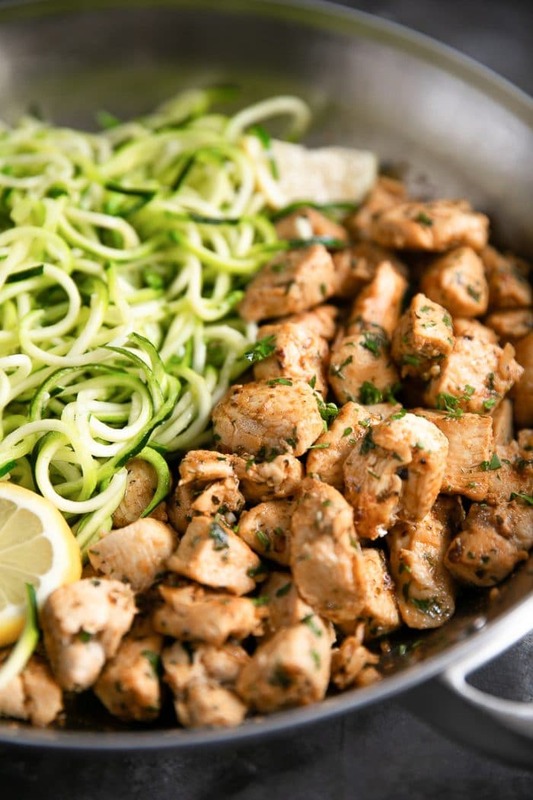 Garlic Butter Chicken Recipe with Zucchini Noodles – Low carb and gluten-free, these delicious little bites of garlic butter chicken are cooked with garlic, butter, and herbs and served with zucchini noodles for the perfect 30-minute, one-pan meal the whole family will love! After updating my bruschetta chicken recipe a couple of months ago and sharing these (reader favorite) garlic butter steak bites with you guys, I thought it would be fun to combine a few of my favorite bits from each recipe to make this simple, easy, and delicious garlic butter chicken recipe with zucchini noodles. Cooked in a single skillet, this amazing chicken recipe will have the whole family asking for seconds! Faster than roasting an entire chicken or baking chicken breasts, this super fast dinner takes just 20, maybe 30 minutes to prepare and cook. Tops. 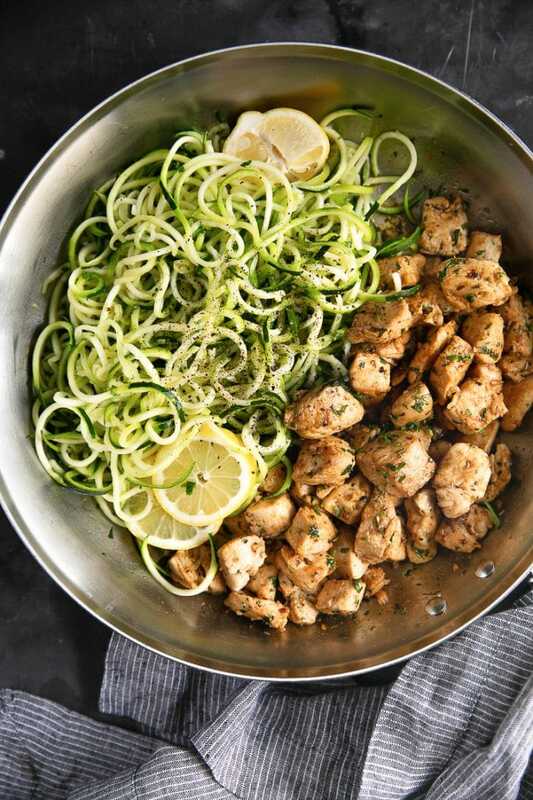 I left the ingredient list for this chicken and zoodle skillet to a minimum – on purpose. 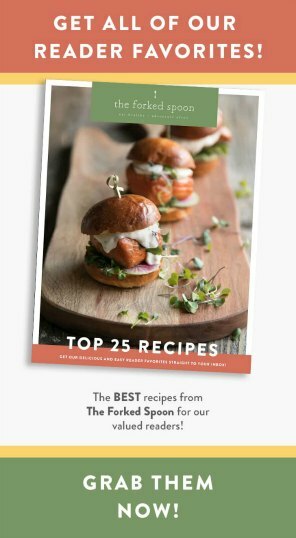 After all, I wanted to make fast-cooking, easy to clean-up recipe with simple, healthy ingredients (yes, you guys. I think that butter, in moderation, is perfectly healthy). Chicken. I used chicken in this recipe because it’s one of the most economical sources of protein and my whole family loves it. That said, feel free to play around and try this recipe with shrimp or pork. Italian seasoning. Italian seasoning is my go-to whenever I make chicken. 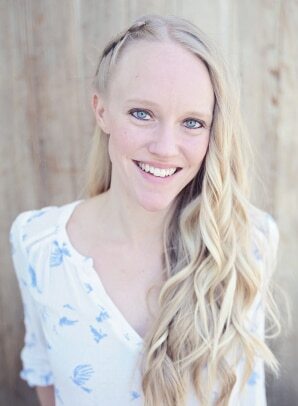 It’s simple, neutral, and easy to make homemade (coming soon) or buy from the store. Garlic Powder + salt + pepper. We’re just seasoning the chicken. No need to go crazy here, just a little sprinkle. Zucchini. I typically average approximately 1.5 medium zucchini per person. Some people may want more and others less, so the amount typically works out. If you prefer regular pasta noodles, go for it! Butter. Yes, you need butter. Salted or unsalted, it’s up to you. 4 tablespoons may sound like a lot, but this recipe is intended to serve 4 people. That equals approximately 1 tablespoon per person. Fresh garlic. Although we added garlic powder to the chicken, it’s always important to get some fresh garlic in there. I added approximately 6 cloves of finely minced garlic and didn’t feel overwhelmed at all. That said if you’re sensitive to garlic, or simply not a huge fan, feel free to cut back on the total amount. Chicken broth. 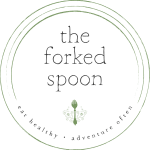 So, you really only need a couple of tablespoons. If you prefer not to open a container of chicken broth and you have some white wine open, that would make a great alternative (similar to shrimp scampi). If you don’t have either, water will work. Fresh parsley (and other herbs). Fresh herbs are always a good idea if you have them. They add an extra layer of flavor and really help dishes stand out. Parmesan cheese. I’m a huge cheese lover, so naturally, I added some grated parmesan. Parmesan isn’t a requirement but tastes pretty delicious mixed with some buttery zoodles. Fresh lemon. Lemon, like the fresh herbs, is one of those easy to add extra elements that really help a dish stand out. I love squeezing fresh lemon juice on my chicken just before serving. 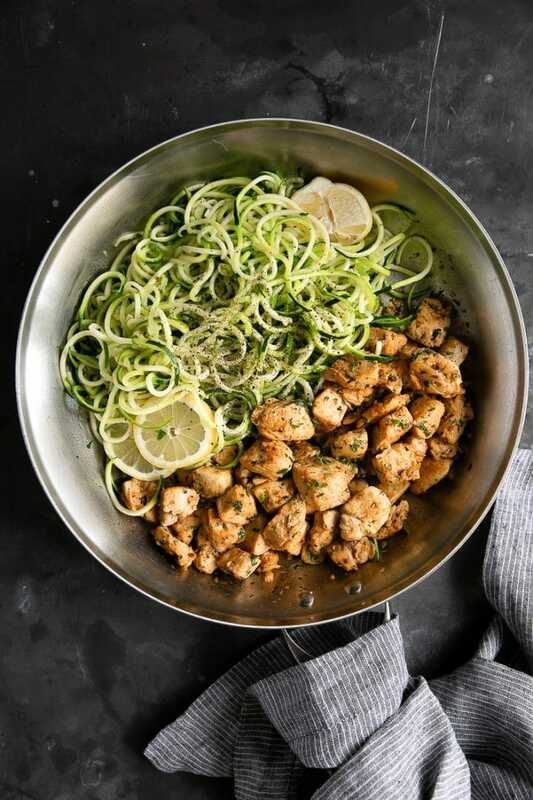 What is the best chicken to use in this Garlic Butter Chicken with Zoodles? Chicken breast. What was used to cook this recipe, chicken breast meat is recommended if you’re looking for the leanest, most protein-packed chicken option. Given the low overall fat content in chicken breast meat, you want to take extra care not to overcook the meat as it is prone to drying out. Chicken thighs. Naturally higher in fat, chicken thigh meat will ultimately result in juicier chunks of chicken. Feel free to use only chicken thigh meat, or mix and match chicken thigh with breast meat. Just be sure to chop your chicken into the approximately same size chunks. Ground chicken. While I have not tried this option personally, I suspect this would taste delicious. Probably the easiest option, ground chicken required no chopping at all. Tip: Hate chopping chicken? Or know you’ll be super short on time? Ask the butchers at your market if they would be able to chop it up for you. In almost every situation, they’re happy to help. Prepare the chicken – Firstly, slice your chicken breasts into small, bite-size chunks equal in size. Transfer the chicken pieces to a large mixing bowl and drizzle with 1 tablespoon of olive oil. Mix well to coat the chicken with the olive oil and then sprinkle with the Italian seasoning, garlic seasoning, salt, and pepper. Mix again and set aside. Prepare remaining ingredients – Since the chicken cooks quite quickly once started, I suggest getting all the remaining ingredients prepped and ready before you start cooking. Mince the garlic, parsley, and spiralize your zucchini (I own this Spiralizer). 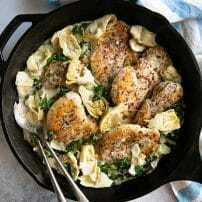 Cook the chicken – Grab a large cast-iron skillet (if you have one) or heavy-bottomed skillet and set it over medium-high heat. Add the remaining tablespoon of olive oil and one tablespoon of butter and swirl to coat the bottom of the pan. Work in batches, if needed, adding the chicken to the skillet in a single layer (avoid overcrowding). Cook the chicken on all sides until just cooked. Remove from the skillet and set aside. Cook the zucchini – return the skillet to medium heat. Add the remaining 3 tablespoons of butter, minced garlic, parsley, and chicken broth. Allow the butter to melt and garlic to cook just until fragrant (approximately 30 seconds). Add the zucchini noodles. Mix well to combine the zucchini with the garlic butter and continue to cook just until the zucchini is warm (approximately 2 minutes of continuous tossing). Return the chicken and assemble – Add the chicken back to the skillet and continue to cook just until the chicken is reheated, 1-2 minutes more. Sprinkle with shredded parmesan cheese, if desired, and lemon wedges for serving. 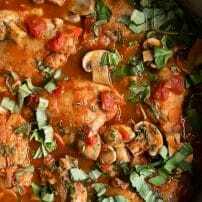 Whether you’re on a low-carb diet, or just looking to get something delicious on the table for your family to enjoy, everyone will love this garlic butter chicken recipe. 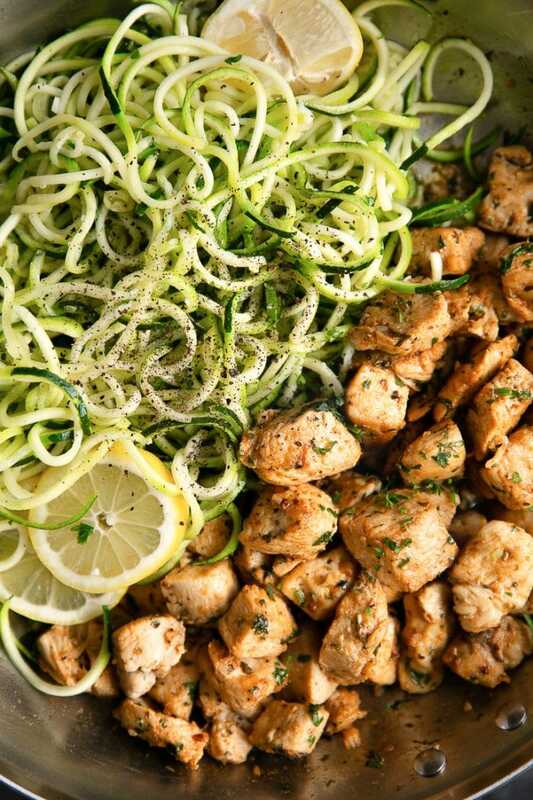 If you’re looking for something other than zucchini noodles, I totally understand. They’re not for everyone. Good news is that this chicken tastes great with loads of different sides. From this super healthy 10 Minute Garlic Bok Choy to this kid-friendly Instant Pot Mac and Cheese, buttery garlicky bites of chicken taste great with all things. For something a little lighter, this Cucumber Salad is one of my favorites. Or, keep it super simple and serve with buttered noodles, roasted spaghetti squash or butternut squash. Looking for more of that delicious buttery garlic sauce? Serve my garlic butter sauce on the side. 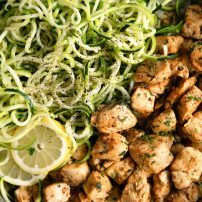 If you try making this Garlic Butter Chicken and Zucchini Noodle Recipe, please leave me a comment and let me know! I always love to hear your thoughts. DON’T FORGET TO PIN AND SHARE THIS EASY AND DELICIOUS GARLIC BUTTER CHICKEN RECIPE AND ADD IT TO YOUR NEXT WEEKLY MEAL PLAN! 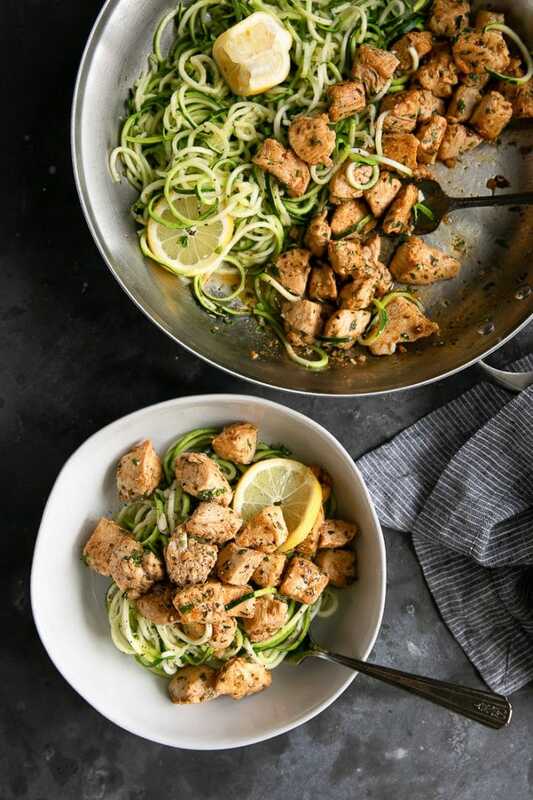 Low carb and gluten-free, these delicious little bites of garlic butter chicken are cooked with garlic, butter, and herbs and served with zucchini noodles for the perfect 30-minute, one-pan meal the whole family will love! Prepare the chicken - Slice each chicken breast into small, bite-size chunks equal in size. Transfer to a large mixing bowl and mix with 1 tablespoon of olive oil, Italian seasoning, garlic seasoning, salt, and pepper. Set aside. 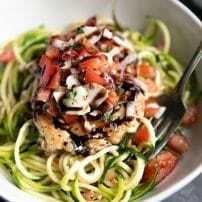 Prepare remaining ingredients - Allow the chicken to rest as you mince the garlic, parsley, and spiralize your zucchini. Set these things aside and get started on cooking the chicken. Cook the chicken - Grab a large cast-iron skillet (if you have one) and set it over medium-high heat. Add the remaining tablespoon of olive oil and one tablespoon of butter and swirl to coat the bottom of the pan. Work in batches, if needed, adding the chicken to the skillet in a single layer (avoid overcrowding). Cook the chicken on all sides until just cooked. Remove from the skillet and set aside. Cook the zucchini - return the skillet to medium heat. Add the remaining 3 tablespoons of butter, minced garlic, parsley, and chicken broth. Allow the butter to melt and garlic to cook just until fragrant (approximately 30 seconds). Add the zucchini noodles. Mix well to combine the zucchini with the garlic butter and continue to cook just until the zucchini is warm (approximately 2 minutes of continuous tossing). Return the chicken and assemble - Add the chicken back to the skillet and continue to cook just until the chicken is reheated, 1-2 minutes more. Sprinkle with shredded parmesan cheese, if desired, and lemon wedges for serving. Chicken thighs may be used in place of chicken breast meat. Zucchini, once cooked for a certain period of time, will drop its water and (at least for noodles from the inside part of zucchini) become quite soggy. 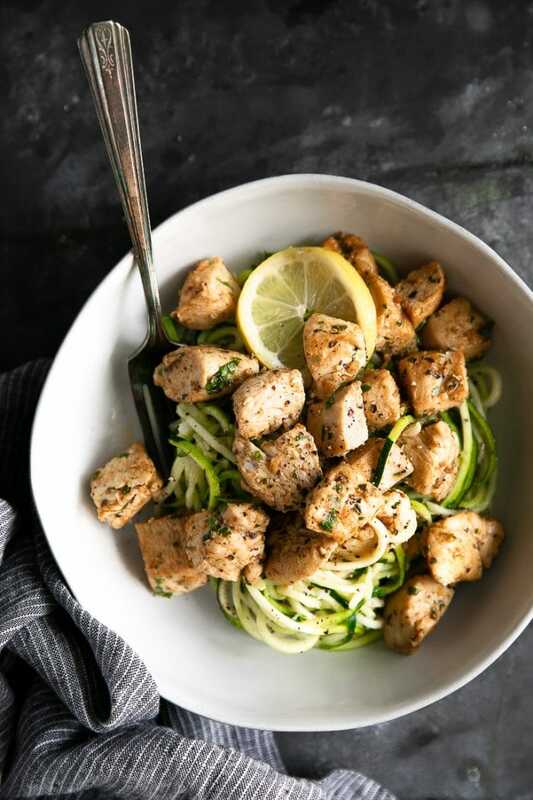 You can help prevent this by sprinkling your pre-cooked spirilized zucchini noodles with salt, allowing them to drop their moisture prior to cooking. Just be sure to rinse and dry your noodles thoroughly before cooking. OR, you can keep an extra close eye on your noodles and plate them before overcooking.